Michael Freeley is an Assistant Professor in Biomedical Sciences at Dublin City University (DCU) and is the Programme Chair of the M.Sc. in Diagnostics and Precision Medicine. He obtained a first class honours degree in Biotechnology from Dublin City University in 1999 and subsequently graduated from the Royal College of Surgeons in Ireland (RCSI) in 2004 with a PhD in Biochemistry and Immunology. His PhD thesis investigated the role of Protein Kinase C isoforms in T-cell activation. 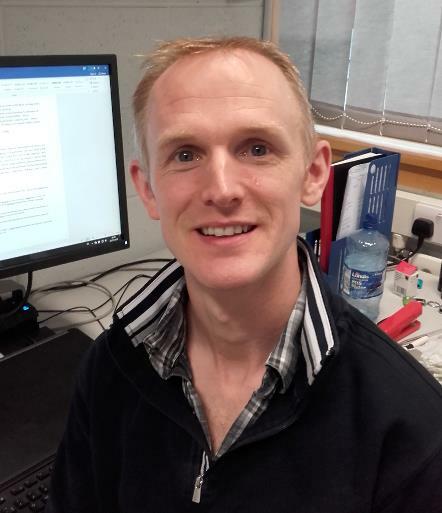 After working in RCSI as a postdoctoral researcher for two years, he took up the position of Research Fellow in Trinity College Dublin (TCD) in 2005 where he investigated the molecular mechanisms of T-cell activation and migration. In addition to this, he served as Course Coordinator of the Ph.D. training programme in Molecular Medicine (2008-2012) and Course Coordinator/Lecturer on the M.Sc. in Molecular Medicine programme (2013-2016) in TCD. Migration of T-cells from the blood into tissues such as the skin or gut and the production of inflammatory molecules is a normal response to infection that protects us from pathogens (elimination of the pathogen while leaving our own cells alone). However, T-cells produce an unregulated inflammatory response in autoimmune/inflammatory disease, therefore blocking this inflammatory response is beneficial in this regard. We are looking at the key pathways and genes that T-cells use for migration/activation and investigating how we can manipulate these pathways for therapeutic effect in autoimmune/inflammatory diseases. Michael's research findings have been published in high impact, peer-reviewed international journals including J. Immunology, Biochemical J, J. Biol. Chem. and Cell Signalling. He has successfully secured funding for his research, including an award from TCD Med Day for identification of novel therapeutic targets in T cells for the treatment of inflammatory bowel disease (2014) and international travel awards from the Government of Ireland Academic Mobility Programme (2017), Ulysses (2007) and Enterprise Ireland (2004). He has also received a number of national and international awards for his research.